A lucky few can say their work helped spur a fundamental shift in the economic model of modern societies. 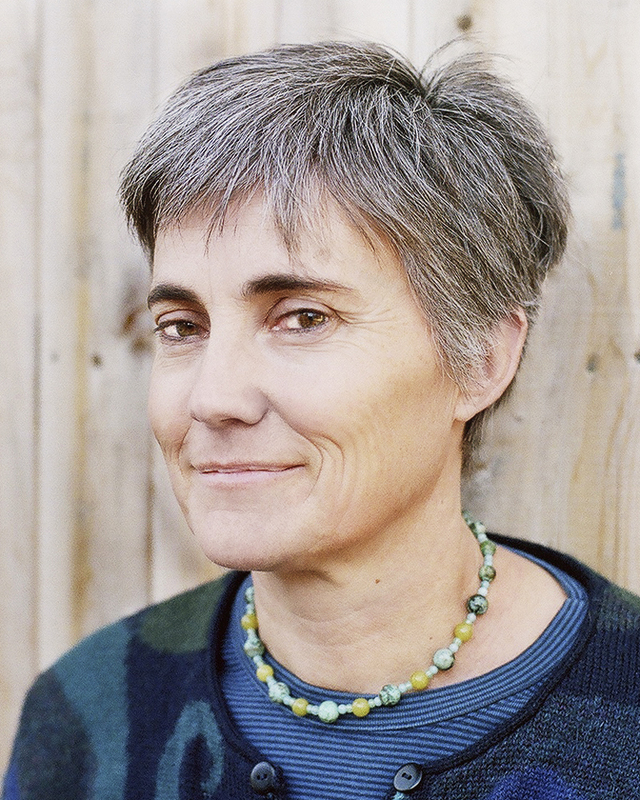 If all goes well, Robin Chase may get to do it twice. A decade before Airbnb and Uber, Chase helped kickstart the "collaborative economy" by co-founding Zipcar, which became the world's largest car-sharing service. The big idea was to enable convenient access to a valuable good (in this case, a vehicle) without requiring ownership. Now Chase and others have founded Veniam. Their technology powers mesh networks, which provide a new way for people and things (devices, cars, appliances, etc.) to connect to each other and to the internet. The holy grail: ubiquitous no-cost wireless internet access that isn't controlled by the telecom giants. Fred Wilson, one of the most influential and successful technology venture capitalists of the last decade, announced in December that his firm has invested in Veniam. "We are consciously trying to see the future and seed the future," he wrote. Chase's story is colorful. She was raised in the Arab world, the daughter of an American diplomat. She is the mother of three children, including one world-famous supermodel. And her career has seen lows as well as highs. "I was a complete shell," she says of one tumultuous period. "It took me, honestly, probably a year to recover." I spoke with Chase for Sophia, a HuffPost project to collect life lessons from fascinating people. She shared practical wisdom about relationships, raising kids, finding happiness, how she approaches aging, and her latest thinking about the collaborative economy. I attribute a lot of what I have to dumb luck. I've made sure that my family and my children have understood that reality strongly. Being a white well-educated American who doesn't have any immediate family in distress -- that was just like a birthright. What a lucky thing. My father was an American diplomat. I grew up in the Arab world. I feel that Americans, in particular, lack an appreciation for how incredibly lucky the circumstances of their birth are. Did you try to foster that in some way with your own children? There's this story that lives in infamy. We're sitting around the dining room table. My eldest daughter says, "I got straight A's this semester," filled with glee, making her younger siblings feel bad. I said to her, "You know, I'm not so impressed. You're no Maya Angelou." I said, "There's three things in life. You were born with the genes that you have through sheer luck. It had nothing to do with you; you can't take any credit for that. Your environment is also dumb luck. You happened to be born to parents who believe in education. You have this great environment. You don't get any credit for that. But you do get credit for working incredibly hard. So good for you. You worked incredibly hard. None of those other things you can get credit for." She fell out of her chair onto the dining room floor, laughing. She said all her peers were getting paid like $20 for each A-grade, and her mom is saying, "Well, an A is okay, but you're not getting a lot of credit for that." Below, Chase's daughter Cameron Russell delivers a TED talk in which she discusses winning the "genetic lottery." I have always lived my life in such a way that I feel like I'm not taking more than my fair share. Everyone should be able to live the way I live. So you know, I have not bought my private jet [laughter]. I went to the Goodwill the other week and I got a spectacular silk designer dress that I was really happy with. I'm still leading a low-consumption, low-footprint life. I think this goes back to, as my father taught me, that I am really an equal. I am an equal. It's profoundly embedded in who I am. I live in Cambridge, Massachusetts, in a very dense urban environment, mixed-income environment. Years ago, it was summertime, I have these three kids, I’m working, so I’m putting them into different activities. Then I thought, no, no. The standard that I should exercise here is, I think every child should get to have those things. I wanted to give my children what you would want for every child. Putting genetics aside, is there anything you've done as a parent that you feel had a lasting impact on your children? As I raised my children, I really wanted to impart that their happiness would revolve around family and relationships and maybe travel, and not around consumption, so that when they moved into adulthood, they could choose a much broader array of career potentialities. They could be a starving artist and be completely happy because their happiness was not stemming from some income stream. My children do tease me that there were never any electronic toys in the house. There were no battery toys in the house. For a long, long time, the dress-up box and the pile of old FedEx boxes was the thing. That's where my value is. Stuff is not -- I'm not interested in that. I don't want to have stuff. You left Zipcar after a period of intense work and fundraising, and shortly afterwards, your father passed away and your daughter’s modeling career took off. What changes did you make to your life after that period? I am a person who works all the time and whose life is their work. I try to make the barrier between work and life -- actually, I don't have a strong barrier, because I really want to be working on things that I care about. By some measures, I am working all the time. Post-Zipcar, I definitely was a complete shell. It took me, honestly, probably a year to recover. And then I promptly started working those same long hours. A luxury of my life is that I've been able, with my spouse, to switch back and forth many times who is the primary breadwinner and who is the primary caretaker. Whether or not I was doing one role or the other, I was still actively working on intellectual and other pursuits. And as my children have aged, whether I'm getting paid or unpaid, I'm still doing the same work. Let me add this. It took me a long time to figure out who I am. Post-Zipcar, I've increasingly figured out that my best strengths are ones that I had never appreciated or really understood. Now, as I've moved forward, I think I have a much better handle on that. I think I'm a good learner. And I'm learning a huge amount in lots of different disciplines. And then, being able to synthesize or seek connections across those fields to see larger patterns and make them feel simple. To do that requires active listening. There's this recursive piece where you are getting feedback from your environment as well as having your own ideas. You're pushing a little bit in the direction that you think is the right direction. And you're listening very carefully to what the feedback is on that. I think that is how we built Zipcar. And I think that is how I've been developing these ideas and this trajectory that I'm on. I talk to a whole bunch of people. I listen to how those words fall, and their reactions and their experiences. That shapes how either I should be thinking or how I should be talking about it. It's this constant, delicate learning and pushing path. It's a funny -- it's a very active and directed listening. What is your latest thinking about how technology is changing our economic models? I have just finished writing a book. It’s called “Peers Inc.,” and the subtitle is “How People and Platforms are Inventing the Collaborative Economy and Reinventing Capitalism.” I'm totally psyched. There is a new organizational paradigm that is happening. It is actively transforming how we build businesses, how we work and how we create economies. That lacks specificity. Actually what's happening is we're leveraging excess capacity, building platforms for participation that organize and simplify the work of these collaborating peers. We have this new, deep collaboration that's very resource-efficient -- ‘resource’ meaning people, money, assets, networks -- where companies or governments or institutions are doing only what they do best. This is because transaction costs have now lowered. Dealing with many small parts is no longer an irritating thing. You don't have to bring it internally. And the “peers” in a peer economy -- which can be people or devices -- are each doing what they do best. So we have this new collaboration that's incredibly powerful and has speed, scale, a high pace of innovation, and adaptability. This organizational paradigm matches our times. The global economy is moving at a very high pace of change. And this structure enables you to iterate and experiment, adapt and evolve, really quickly to match that pace. It also changes the power structure. If you think about capitalism, it was based on scarcity and hoarding of assets, like trademarks, intellectual copyrights, secrets. This new economy is saying, actually, open shared assets deliver way more value than the old way. It is a fact. It's kind of the end-run for the Internet. The Internet was created 40 or 45 years ago. But we've really been working with it for about 25 years. Now it's kind of come of age. We're able to figure out, what are its powers? How do we use it? The collaborative economy is larger than the sharing economy. The sharing economy feels to me like it's about assets. The collaborative economy is everything. It’s making clear and visceral to us that, if I can have real-time access not just to hard assets, but to people, to networks, to experiences, it means that the way I do my own personal life is completely transformed. I don't have to do any hoarding. I don't have to be worried about having stuff and owning it. I can start to rely on the fact that I can reach out and find the right person at the right moment. That dramatically transforms how you live. 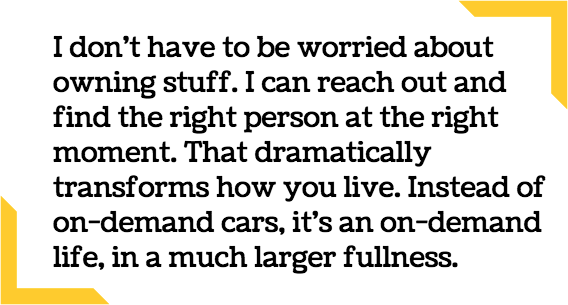 Instead of on-demand cars, it's an on-demand life, in a much larger fullness. It really shapes our potentiality and the pace at which we can do that. What books have had a profound influence on your life or intellectual development? One was “Guns, Germs, and Steel” by Jared Diamond. It’s a book that I loved for years and years. After I read it, I bought 10 copies and gave them to different people. That’s the only time I ever did that. The book comes back to this idea, what is the dumb luck that you're handed? The thesis is: where biology and geography intersect became our destiny. I found it totally fascinating. More recently, there are a bunch of thinkers over these last 10 years who are either researching or implementing or writing variations on this incredible economic transition that we're in. There are people like Yochai Benkler and “The Wealth of Networks.” Jeremy Rifkin, Chris Anderson of Wired and I share a lot of ideas. Tim O'Reilly, Lisa Gansky. There’s a whole group of thinkers and doers that are all moving in this same direction, seeing what the underpinnings are, what the new tools are, what the implications of those new tools are. Terribly, because my mind does not shut down. I can fall asleep, and then the second I come out at all, it snaps on. I start thinking about 10 different things, can't get back to sleep. That's how I sleep. Do you have any advice regarding relationships? The person that you happen to choose as your spouse is so incredibly important. I think women in particular are enablers of bad behavior. They're finding a partner when they're between, say, the ages of 22 and 30. There's some shaping potential to be done. And yet, they don't demand their partners take a 50 percent share in household duties, child-rearing, cooking, whatever it is. So the enabling starts. Then they work themselves into a corner. I was giving a talk the other day to all these veterans who are entrepreneurs. They were 92 percent male. As I was talking, it suddenly occurred to me that, when men also don't learn how to be competent at child-rearing and these other activities, they are covertly telling their spouse -- who is supposed to be the person they love the most -- "You know what? I'm going to be hobbling your career potential because I'm going to be unskilled and useless." I feel like it's a value judgment. I want to put the burden also on those men. When they are incompetent or unwilling, they are saying our professional futures are not equal. How did you adjust your marriage after children? The world is divided into two groups: people who have children and people who don't. It is night and day, having children and not having children. I think of children as “human objects” until the age of like 14 [laughs], i.e., 24 hours a day, every second, you are responsible for them. The way I'm living now [no longer with young children], every morning I wake up and think -- how incredible! I can lie in this bed, or I can get up! I can change my mind! I can leave the house. I can make appointments. I can travel. When you are with children, that is all locked down. The freedom of your life is just dramatically different. I certainly did not appreciate it. And when I had my first child, I thought, whoa. No one clued me in on what a giant hit having this child is on my personal autonomy, which impacts my ambition in life, professional potential, and so on. It is a giant hit. Is there a particular reason you chose to have three children? Greed. [laughter] I used to work in public health. I was allowed my 2.2 children. Then I hid my third pregnancy for as long as I could because I thought, my god, this is greedy. This is antisocial. This is a total embarrassment. Yeah. Also, I'm laughing about three children. My husband was less for it than I. I thought, two children is just so easy. [laughter] Life is so pat, you know. Two in front, two in back! It's one adult, one child; it's so simple. Let's shake things up here. So that was also why I had a third child. To make life more akilter. Have you taken any travel journeys that you would recommend to others? A really instructive thing is to have Americans understand what a totally different economy and different GDP look like on the ground, living it. We've done a number of vacations where it's been this six-dollar-a-night type of place, a treehouse, a cruddy place in the corner. My son had this great line. He said, "Wow, people can be really happy without money." And I just thought, yes. Bingo. Let's get that. It comes back to this privileged life. I want to say 90 percent of the time, when I step into my warm shower, I'm thinking, how incredible. I am standing here, and there's this running water, and it is warm. What an amazing thing. I honestly think about it almost every time I take a shower. Or wow, I'm lying down on a flat bed, and these sheets are so clean. I'm appreciating that all the time. How are you approaching aging? What's curious is around age 52, I suddenly started to think about old age. I had never ever thought about it at all. You never picture yourself there. And suddenly, at this really late age, I thought, wow. My eyesight is declining, my knees creak. I’ve realized that there's a whole bunch of women in their 70s that are really fabulous. And I thought, I'd like to be one of those really fabulous women in their 70s. But in order to be a fabulous woman in your 70s, it means that I have to be intellectually astute and up and active and engaged now. Is there anything else you wanted to discuss? Yes. Addressing climate change. Let's get with the program. Right now, this very moment that we're sitting here, it's either we make dramatic changes or we're moving into a catastrophic world. It is honestly a crazy reality. It is catastrophic. We're seeing institutions one by one acknowledge it -- the World Bank, the U.N., the IPCC and Obama -- but it’s couched in these little careful terms. As we're sitting here, the highest likelihood is that we will go to between plus-7 degrees Fahrenheit and plus-10 degrees Fahrenheit global climate change by 2100. What in the heck does that mean? Minus-7 degrees Fahrenheit was the last Ice Age, 20 thousand years ago. And Boston and New York and most of North America was under one kilometer of ice. So we went from one kilometer of ice, 20 thousand years ago -- we are going hotter that amount of change in 85 years. That's what we're doing right this second. Even 40 years out is looking pretty rotten. And that's if we do the things that we promised to do. If we don't do those things, which is exceptionally likely, it's in 20 years. It is not some distant thing, and it is not some small amount. This is ecosystem collapse. So one of the things I think about Zipcar is that people realized, sharing resources leads to a better world. I have a better quality of life. I save money. And it actually has this dramatically strong environmental underpinning. So we can go there proactively, making it as best as we can, or not. I think you do go through these seven stages of acceptance. And I think people are, right now, all around in the giant denial. If they aren't in a giant denial, they're in the pissed off phase. And we have to move through that and get to -- let's get going. Let's do it.